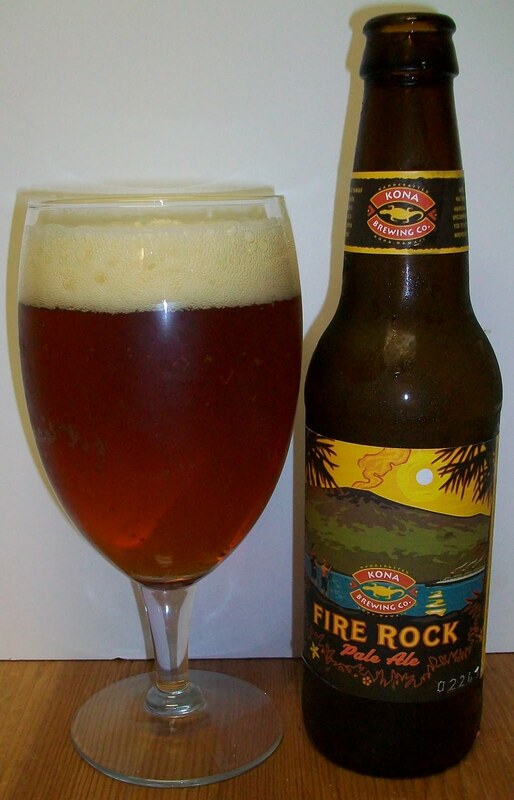 Fire Rock Pale Ale is a crisp, refreshing “Hawaiian-style” pale ale. Its signature copper color results from the unique blend of specialty roasted malts. The pronounced citrus-floral hop aroma comes from the liberal amounts of Galena, Cascade & Mt. Hood hops added to each brew. This was a recommendation from my brother-in-law Anthony. I have never had it before now. So I’m looking forward to seeing what it’s like. The beer pours a clear light amber with an off white head. There is a nice pleasant nose on this beer; light caramel malt aroma with a light citrus hop notes along with an interesting sweetness. Not a bad first sip. There is a nice pleasant sweetness to the overall taste of this beer. I’m not sure exactly where that is coming from. The also seems to be a citrus aspect to this as well along with a nice dry hop but not bitter finish. This is a very easy drinking beer. Let me attempt a better play by play. There is an interesting caramel almost toasted malt sweetness up front on the tip of the tongue. This malt sweetness carries through the middle of the sip along with a nice effervescence. The back-end is smooth and easy to swallow, this is also where you start to pick up this unique sweet citrus and hop flavors, never bitter and very refreshing. The hops and citrus carry into the finish which is very nice, somewhat dry and extremely refreshing. The final aftertaste is just a faint hint of the whole experience; some caramel malt sweetness, some citrus and dry hops stay with you. I have mentioned the hop flavors several times in describing this tasting experience but at no time are the hops in this beer ever bitter. These are the most unique blend of hops and are packed with flavor, without the bitterness. Well, I can see why this is Anthony’s new favorite beer. This beer is also warming well, it is now at 67 degrees and it is much smoother now. And more importantly it is not picking up any unpleasantness. This is a very nice beer. It has the mouthfeel and looks of a good amber ale but the subtleties an citrus notes of a summer pale ale. This is one beer I could definitely drink all year round; full of flavor and refreshing. All and all I’m quite pleased with this find. Thanks for the suggestion Anthony. I’m going to give this a B+ for now. I will definitely be having this again and I may bump it up a notch later. But for now a B+ will do quite fine. I highly recommend this beer to anyone that is looking for a good pale ale. This is a very pleasant easy drinking summer beer that you really can drink anytime. With the citrus notes in this brew it may also be appealing to the Blue Moon wheat beer crowd as well. So far Kona is 2 for 2, I also liked the Pipeline Porter. Now I have to go back to State Line Liquors for the Longboard Lager and the Wailua Wheat Ale.